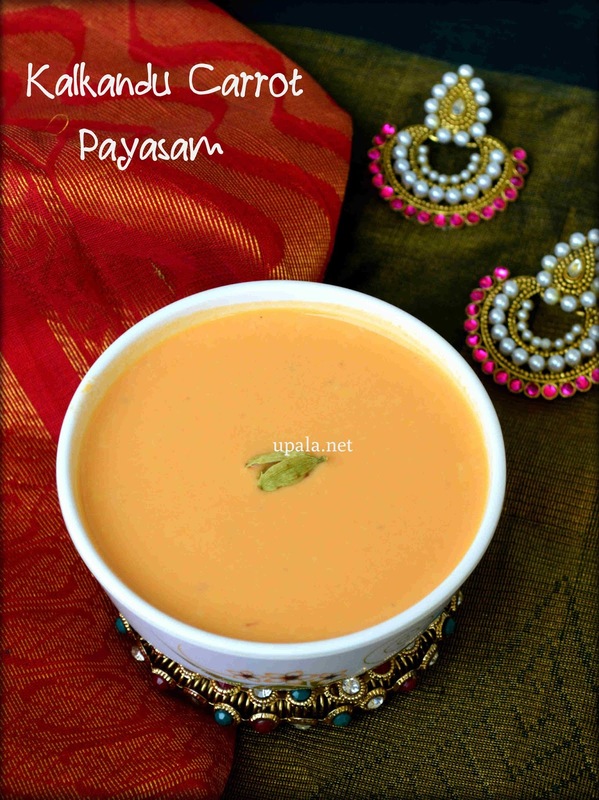 Kalkandu Carrot Payasam/Carrot kheer using rock candy is a healthy dish that tastes heavenly. I tasted this Carrot kheer in a birthday party and couldn't resist myself to relish another serving. My close friend shobha made this kheer for daughter's birthday party and served it chill with loads of nuts floating on top. I have already tried carrot kheer but this kheer was exhibiting a totally different flavor. I was guessing that she could have used milk maid to prepare this recipe but to my surprise, she didn't. I chased her and got the recipe, then could realize that she had ground the carrot to a fine paste with nuts. My special thanks to my dear friend who gave me the recipe for this super yummy dish. If you prefer a carrot kheer with thin consistency also carrot chunks getting in your mouth when you relish this kheer then go for my previous post on carrot kheer but if you want a thick creamy kheer then here is the recipe. Though my friend didn't use rock candy, I have used rock candy to prepare this as kalkandu payasam. Healthy options that I suggest are using brown sugar or palm candy for sweetening. Also, I have ground cashews and almonds to get nice thick kheer which can be replaced with melon seeds or pumpkin seeds or sunflower seeds with less calorie. 1) Wash and peel the carrots, chop them as roundels as shown in picture. 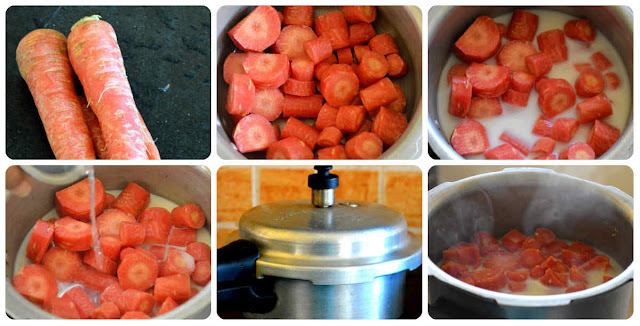 2) Add 1/4 cup milk and 1/2 cup water to the carrots and pressure cook for two whistles or till they turn soft. 3) Soak the Cashews and almonds in hot water for half an hour. 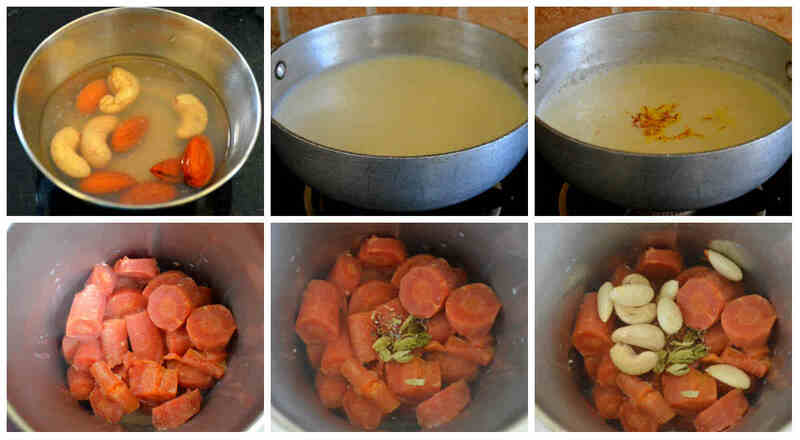 4) Leave the carrots to cool down, meanwhile boil milk in a heavy bottom pan/Kadai. 5) Add saffron and continue the boiling process till the milk reaches 3/4th of its consistency. 6) Now, remove the carrots alone and grind it along with cardamom, cashews, and skin peeled almonds to a fine paste. You can add the carrot cooked milk+water mixture while grinding if needed. 7) Add sugar and rock candy to the boiling milk, leave it to boil for 10 more minutes in low flame and switch it off. 8) After the milk reaches luke warm temperature, mix the ground carrot paste to the milk and stir well. 9) Break the lumps and keep stirring until the carrot paste dissolves well. Refrigerate this yummy Kalkandu Carrot Payasam/Carrot kheer using rock candy and serve chill topping with finely sliced nuts of your preference. 1) Don't add the ground carrot paste when the the milk is boiling as it might curdle the milk. 2) Since, you would not be using the carrot cooked milk+water mixture, it is better to add only as required amount so that you would not discard much instead use it for grinding. 3) If this kheer thickens, you can add milk to adjust the consistency. Also, don't forget to adjust the sweetness too.